Hi, to all our Vintage Journey Travellers, it's JULIE here today with the next leg of our journey for this month. 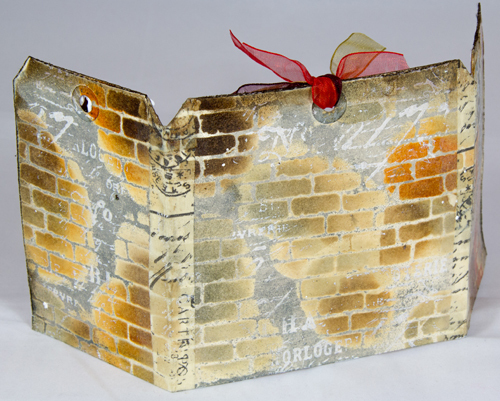 Hopefully you will feel inspired with my project to make a start on some Christmas crafting. I always find working on tags rather challenging with the dimension and space you are given and recently when I was at Wendy Vecchi's workshop she said she trims her tags down to help balance them and I must admit I find them a lot easier this way. I started off with one size 12 tag and two size 8 Manilla tags. I trimmed them all to 5 inches in height, tattered my edges and applied Tim's tape to both sides. 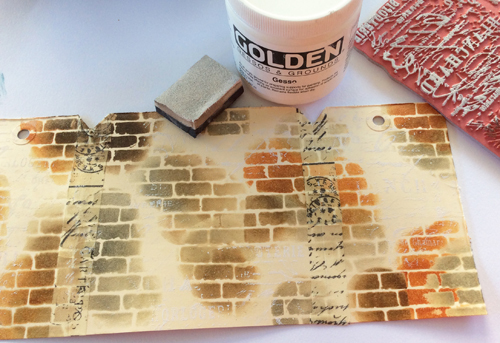 Using my Brick stencil I applied Distress ink to both sides of my Tags using Hickory Smoke, Rusty Hinge and Ground Expresso. Next I heat embossed with clear embossing powder. I now stamped a little gesso to act as another resist for extra detail. Now spraying on my Hickory Smoke Distress Stain. 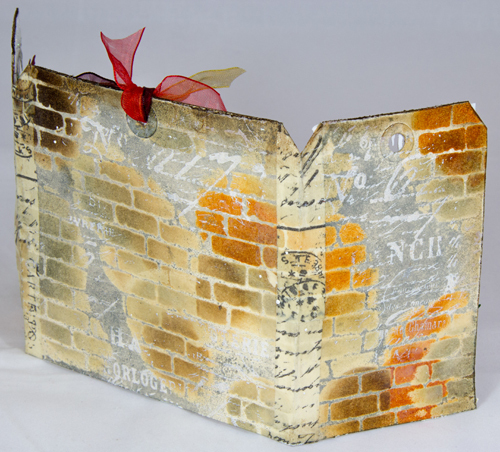 Notice how it resists over my heat embossed bricks and Gesso and gives a look of cement between the bricks. 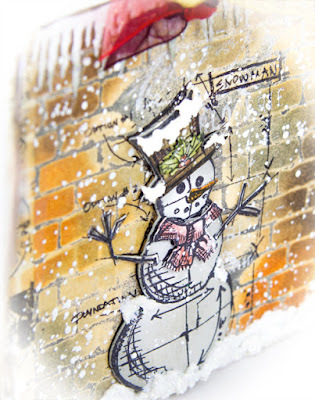 I now stamped my Snowman with Black Archival Ink. At this stage I also scattered Chunky White Embossing heat setting from behind. 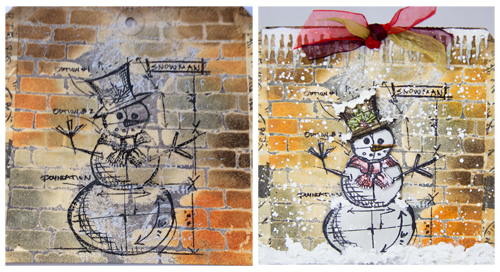 My Sizzix Snowman stamp and die set was stamped in Archival ink and die cut out. I shaded with Distress pens, adding Snowtex along the base and onto my Snowman in parts with a layer of extra fine Glitter over it for added sparkle. My Cheery Lynn Icicles I sprayed with glue adding extra fine glitter. Next adding a little Iced Spruce Distress ink to the edges and a little Glossy Accents for an icy effect to finish. 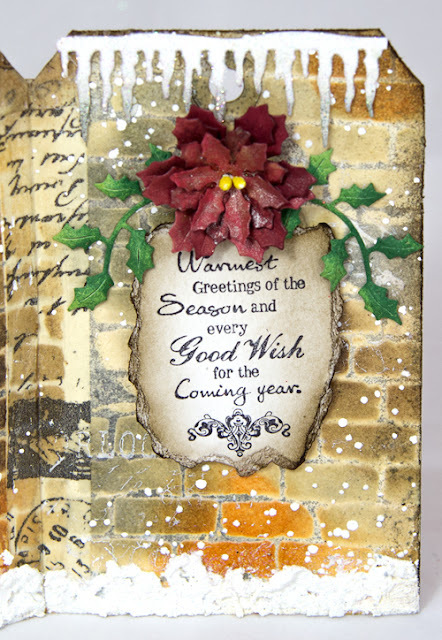 I stamped my sentiment, tearing around the cardstock to reveal the core and adding some Ground Expresso Distress ink, finishing off with my Holly Leaves and Cheery Lynn Poinsettia. My Sizzix Pine Cones were cut out in Kraft cardstock and inked at the edges. 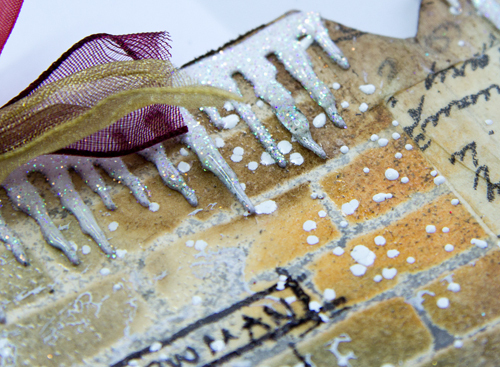 My Sizzix Deer I stamped some texture on to it and added Snowtex, glitter and embossing powder. My Pine Branch is made from a Cheery Lynn die and I added some Flower Soft Snow. My 25 was heat embossed with Red Tinsel Embossing powder to add more sparkle. Finally finishing with some ribbon. And a final view of the reverse side. I do hope you have enjoyed my post today and feel inspired to try out some of my techniques I used on this project. 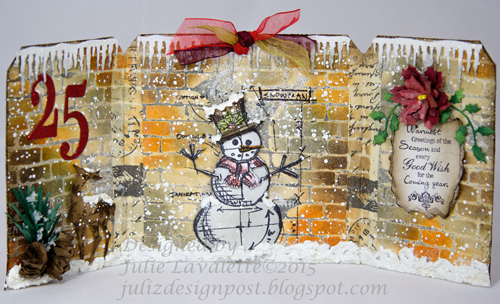 Such an amazing project Julie! Well done, great idea for a triptych and perfectly embellished! Stunner Julie...perfect for the upcoming season. Love the way you have joined the tags. This is beautiful, Julie! Love all the details! 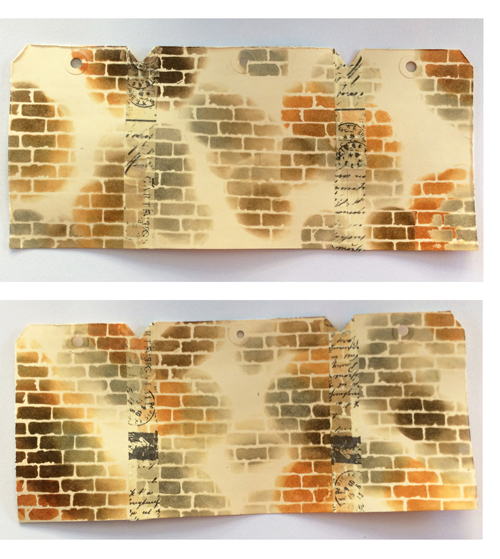 Love this new "take on tags" . .. at least for me! Thanks for sharing the creativity and inspiration! A gorgeous winter scene! I love the brick background and thanks for the explanations. What a great idea to attach the 3 tags together Julie! Beautiful Christmas/winter make! The icicles ans snow flakes as well as the brick effect, look fantastic! Love the whole piece, it looks super! 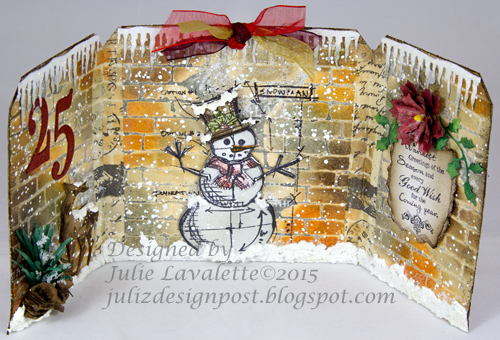 Fabulous, Julie - love the glow of the distressed brickwork and the top and tailing with the snow and icicles - a gorgeous triptych of tags. Oh my gracious Julie - this is ASTOUNDINGLY LOVELY. I can't believe how you used the tags and the tape and made such a nice big pallet. Genius! And the brick is the prettiest brick I ever saw. All the additions and the glitz, glam, shimmer - it's just GORGEOUS and FUN and well... it's FABULOUS. j.
Oooh this is so beautiful and lovely Julie!!! Fabulous project and thanks so much for the great tutorial. Congrats on a job well done.